— Shannon Watts (@shannonrwatts) 1 октября 2018 г.
Vega made an attempt to ask him a question about the FBI investigation of sexual assault allegations against Supreme Court nominee Brett Kavanaugh, but Trump said that the presser was about trade. — Cecilia Vega (@CeciliaVega) 1 октября 2018 г. A White House transcript is now alleging that Donald Trump replied “not thanking,” which, as many social media users have observed, doesn’t make any sense. — Steve Herman (@W7VOA) 2 октября 2018 г. It sounded like she said “thinking”, not “thanking”….doesn’t change how utterly offensive his comment was. — Momo (@Momeaux) 2 октября 2018 г. No, on video it's clear as a bell said "thank you". — ℬ𝓡𝒜𝙕𐐁𝒩 𝓗𝕌𝑺𝑺𝓨 (@0neOfDem) 2 октября 2018 г. He says, "I know you're not thinking. You never do." Her response of "I'm sorry?" shows that she understood his slight. Watch the video; for anyone to claim that the two of them said 'thanking' is preposterous. — 𝙲𝚑𝚞𝚌𝚔 🇨🇦 (@Easy_To_Slip) 2 октября 2018 г. Way to go Cecilia for handling the situation like a professional. He was unnecessarily unkind and wrong in that situation. That wasn’t the pres mocking the press, that was rude behavior to a woman for no reason. — JustinMattsMom (@StaceyR43) 2 октября 2018 г. — donna fitzgerald (@donfitz1948) 2 октября 2018 г. As women, we have all heard that dismissive, condescending tone used on us before. We recognize it for what it is. We hear the GOP and Trump loud and clear. We will use our annoying, brazen voices to vote. — Chris Belmont (@ChrisBelmont9) 2 октября 2018 г. — Gordie & his Mom for decency (@ms_spaniel) 2 октября 2018 г. This is why men think they can humiliate and degrade women. Our pres does it, and his ppl behind him thinks it's funny. — Noare/Paz a Catalonia (@passion4recom2) 1 октября 2018 г. — Dani Sipes (@DaniSipes) 1 октября 2018 г.
Bless you Cecilia for keeping your cool and composure. That exchange was awful and Trump’s a bully acting out. Great job keeping your focus! — Misunderstood Ninja (Wu Tang Name) aka Theresa (@TBoisseauATX) 1 октября 2018 г. — Paulie H (@PaulieH666) 1 октября 2018 г.
Bully? This was HIS news conference on TRADE! Why didn't she ask a question on trade? That's why they were there! She should have waited but no, she had to be rude to try to move to a different subject! — 👠 Lorraine🍸 (@softhartzz) 1 октября 2018 г.
I totally agree!!!! The media has no respect. Of course she didn’t want to talk about trade. I’m tired of watching the majority of our media work for the Democratic Party! — Lisa M Shaw (@lmsinpvb) 1 октября 2018 г. — Tony Smith (@bobtonysmith) 1 октября 2018 г. Sure, and it doesn't have to be answered on your schedule. The presser was about trade, @POTUS was very polite and said he'd do Kavanaugh after trade, but YOU want to change the narrative. — Peggy McClain (@redwildcat) 1 октября 2018 г. — Steve Wilson (@SteveWilson68) 1 октября 2018 г. 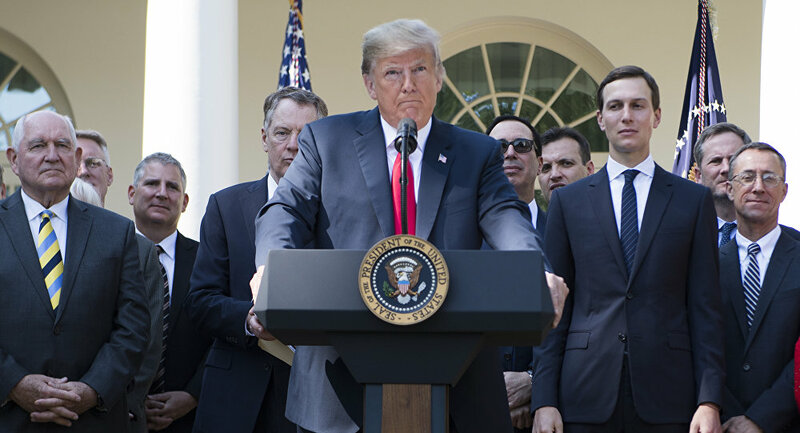 On October 1, the United States, Canada and Mexico reached a new trade agreement, dubbed USMCA, thus replacing NAFTA – a cornerstone in the trilateral relations. The new deal is expected to be signed in 60 days.